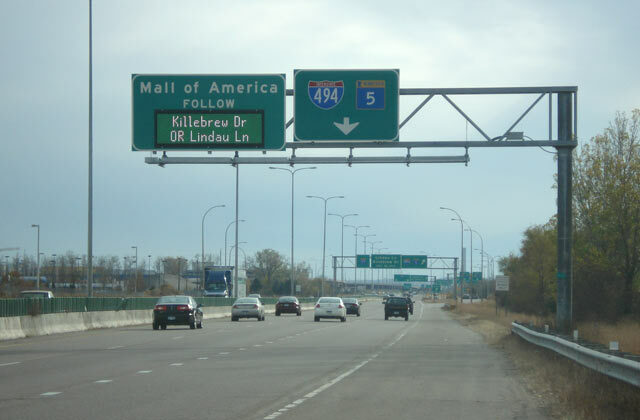 To effectively manage traffic on the roadway system surrounding the Mall of America, the City of Bloomington hired Alliant to design and oversee construction of a wayfinding system. The system helps direct visitors to the mall ramps and surface lots that have available parking and also guides visitors to the surrounding freeway network as they leave the mall. The system includes several Dynamic Message Signs (DMS) and CCTV (Closed Circuit Television) cameras that are linked by a fiber optic network. Alliant was responsible for the design of the DMS, CCTV cameras, supporting overhead sign structures, and the fiber optic communications network. Construction was successfully completed in 2015. This project is the second of three phases within the City of Bloomington’s wayfinding system. Alliant also completed the first phase and that involved installing DMS on the surrounding interstate system in 2011. The South Loop Local Road Wayfinding project won an Honor Award in ACEC/MN’s Excellence in Engineering awards competition.